Leaseum Partners aims to raise a $250 million USD commercial real estate fund invested in New York City through a crowd sale open to accredited investors. Double digit IRR performance funds have traditionally been reserved to large institutional investors who can meet the minimum investment requirements (in the millions) and long lock-up periods. Leaseum Partners first fund is aiming at 1. making a product that is available to all accredited investors with a much lower investment minimum,2. offering enhanced liquidity and 3. increased performance through the use of blockchain technology. Also, unlike some blockchain projects with no clear ROI mechanisms, token holders will receive quarterly dividends generated through rent income,capital gains on properties that are sold once the 10 year fund expires and additional profits generated through our Smart-NAV tracker mechanism. The other big difference with a lot of tokens on the market is the fact that Leaseum tokens will be asset-backed, as the fund will be the owner of NYC real estate property. More on our investment strategy and target performance is available on our website www.leaseumpartners.com. We are aware that there are several real estate-based blockchain projects and startups that have emerged in today’s market, but Leaseum is the first and only project of its kindfocused on raising a fund through a token sale that will be dedicated to acquiring core-plus and value add commercial real estate in New York City, paying out dividends to investors in either FIAT or cryptocurrency. Blockchain technology has gained a reputation as a “disrupter of industries”, stemming from its ability to provide a more efficient, trustless and transparent alternative to executing different business processes. A recent influx of interest in blockchain technology has sent innovators and developers flocking to their drawing boards, exploring different implementation methods of this promising new technology. During this innovative craze, we focused our own research on the potential benefits of applying blockchain technology to real estate investments and associated processes. We began by identifying several of the problems that currently exist in the real estate industry and followed up by exploring how blockchain technology can potentially address these problems. After more than a year of intensive work, we were able to come up with a blockchain-based solution for almost every problem that we had identified. We were also deeply intrigued with the concept of Initial Coin Offerings (ICOs), or Token Generation Events (TGEs), which had raised large investment capital in such short periods of time. Some of the projects we studied had not even provided investors with a clear path to ROI, basing their campaign entirely on promises and speculation, yet nonetheless had raised millions! The concept of Security Token Offerings (STOs) really grasped our attention, because token-based securities are a proper asset-backed investment class, one that institutional investors would be much more open to. Many people who invested in ICOs did so because the opportunity to invest in startups had not been available to them in the past—it had only been accessible to venture capitalists and accredited investors. However, ICOs had succeeded in opening the floodgates to retail investors, allowing just about anyone to invest in new blockchain projects. These offerings have gained attention from regulators as well, with the Securities Exchange Commission (SEC) investigating whether some of these projects can be considered as securities. Our team (introduced at the end of this post) has a proven track record of managing properties in NYC, as our portfolio manager Michael Chetrit currently manages approximately 1.5 million square feet of real estate in NYC. Because we are essentially the first to propose and implement this type of tokenized business model, we are minimizing our investors’ risk by focusing this Real Estate fund specifically on acquiring New York City properties due to their stability and wide appeal. We acknowledge that we are selling tokenized securities, and comply with all of the required regulations. Only accredited investors will be able to purchase Leaseum tokens at any point in time. The real estate industry is the largest in the world, worth a total of approximately 191 trillion USD, with 29 trillion USD in commercial real estate alone. Because the real estate market has existed for so long and there are so many intermediaries involved in this asset class—governments, lenders, banks, brokers, title companies and private citizens—we are fully aware that tokenizing real estate will not be as easy as flipping a switch. It is a long and cumbersome process that will require lots of time and effort for this concept to become accepted as a norm. 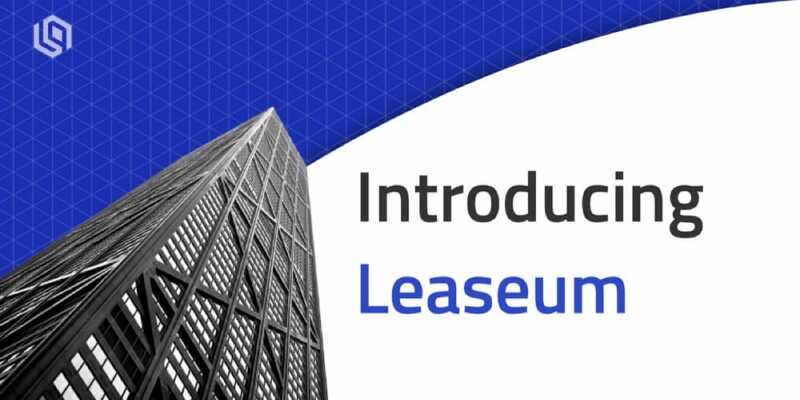 Our Leaseum tokens represent direct fractional ownership rights to the portfolio of buildings that are purchased by the fund, and risk is set to a minimum because our tokens are backed by physical assets belonging to the largest asset class in the world. Because this is such a new concept, to begin, we are utilizing blockchain technology at the portfolio level and dividend distribution; property management processes will be completed using traditional methods for now. Our team is made up of professionals with an aptitude of knowledge and experience in real estate investing, financial management, regulatory compliance and entrepreneurship. We genuinely believe that our team is one of Leaseum’s strongest attributes, clearly distinguishing us from any existing competitor. Leaseum Partners is utilizing blockchain technology to disrupt traditional processes associated with investing in commercial real estate by providing token holders with dividends, voting rights and capital gains rights. We are currently finalizing our White Paper, which will fully detail our business model as well as the technical details associated with Leaseum.